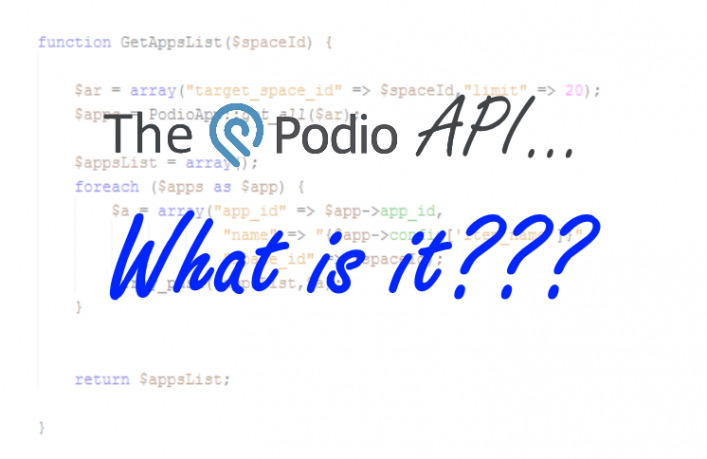 My Blog What is the Podio Api? Podio is a great tool that can please almost everyone from the not so technical to the tech nerd. The only common trait to all Podio users is a desire to create a custom system for their business. This article is going to talk about one aspect of Podio, that to me is at the core of what makes it so powerful, the Podio API. I'm not going to teach you how to use the API here, but just to give you an understanding of what it is. Point blank...to use the API you need to have an understanding of programming languages (like C#, PHP and Ruby-on-Rails) and other web based technologies. It is not for everyone. Though where there is a desire their is a way...you could always hire someone right? This is not the easiest thing to explain, but I'll give it my best try. An API or Application Program Interface is a method in which a company (or Application) can give access to data, processes and services outside of the application. They do this by creating an API that contains commands that you can call that will execute a process on their servers. These processes can include things like retrieving a Google Map Image of a property, or a Zillow Estimate to include on your web page or in your own custom App. Unfortunately it is not that simple as it is more complicated then just making a call to the API service. Usually you need to create an account with that service, get a unique identification code (and password) so the service can authenticate and track who is requesting the info. Get a group of App Items or a Specific item. Basically anything that Podio can't do inherently you can leverage the API to do it for you. Did you know that Globiflow and Zapier use the Podio API to interact with Podio? In fact it is at the core of how they work. While Globiflow uses the Podio API exclusively, Zapier is written to communicate with 1000s of APIs across the web...Podio just being one of them. Basically how it works is that when something happens in one of your Podio Apps, Podio sends out a webhook to Globiflow. A webhook is just a call to a website address telling it what has happened. Along with the message is usually some information about what item was affected and how. If you go into one of your Apps, click on the wrench and go to Developer Info, you'll see the Webhooks there. Here are the Globiflow hooks. Globiflow then reacts to that information and executes the desired flows. These flows use the Podio API to then create or modify items back in your Podio Workspace. It's very very cool!! There isn't a ton of resources to learn about the Podio API outside of their own documentation on it. However, I will say that it is a very well put together and has some good examples. For those that still need something beyond what GlobiFlow can offer there might be an easier way to leverage the Podio API in a more custom way. I recently discovered ProcFu. This was developed by the same person(s) who create Globiflow. ProcFu is basically a collection of scripts written specifically to help access the Podio API without having to write any lines of code. It gives an interface (input forms) for many of the API commands. I haven't used it yet, but it does seem promising. For one thing the scripts can be called from Globiflow. I'm going to try and experiment with this over the next month and see what kind of benefit it can provide. So look for that article when it comes out. If you need to take Podio beyond what Globiflow can do, then the API can make that happen. I love it and have almost eliminated Globiflow from my workspaces. With that said though, don't get your hopes up. What I mean by that is, the time (or money) you'll invest in leveraging the Podio API will be quite a lot. You'll need to write the scripts, host the script file on some webhost and maintain it yourself. LOTS of learning different web technologies involved. Even for me as a developer. If anyone has any questions about the Podio API please let me know and I'll be happy to answer them for you. Great article as usual. I can’t wait for the rest of the series. My vote is for sending voicemail through Slybroadcast. Thanks. I am using a ticketing app to enable my clients to report issues. I want to see the tickets information from my app in the Podio. How can I do this using Podio API? The ticketing app that I use also provides API calls to get the info. What is the name of the ticketing App? Perhaps Zapier has the ability to connect to it. If so you could use Zapier to pull the tickets from that system and import them into Podio.